John Rousmaniere and Olin Stephens aboard Bolero. Olin Slephens holds the record for number of his designs that took part in the race. 2006, marked the centennial of the classic Bermuda Race. When it was first sailed in 1906 from New York City, the Bermuda Race made the sea a playground by creating a new sportocean racing by amateur sailors in normal boats. Over the past 100 years, some 4,500 boats and 46,000 men and women have raced to Bermuda, most of them with little real hope of winning. We were there at the start of the Centennial Race on race committee duty, with a record number of entries sent off to sea like clockwork in ever more impressive classes. It was a beautiful dance to watch. 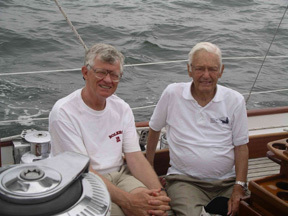 John Rousmaniere  yachting historian, writer, accomplished sailor, and true gentleman - was also at the starting line this year as in many years past. We could not think of anyone better to be telling the story of this classic race from Newport, a legendary starting line, to Bermuda, a speck of an onion patch on the ocean. Sponsored by the Cruising Club of America and the Royal Bermuda Yacht Club, the race now is so competitive and compelling that all heads turn in the direction of its mere mention, so challenging that sailors ask themselves why they are doing it again, and so addictive that they keep coming back. Held every other year (alternating with the Marion to Bermuda Race which is for ‘cruising sailboats’), and no longer a contest entirely for 'normal boats' given some of the high end entries, it is the race to take part in. 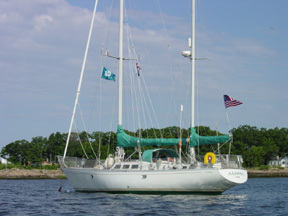 Jim Mertz of American Yacht Club held the record for most number of Bermuda races sailed at 30 - his last being in 2004. In this lavish book replete with historical facts and photos, John Rousmaniere tells the story of the remarkable sailors, the great boats, the tactics, the Gulf Stream ordeal, and the lure of Bermuda that make this the world’s classic ocean race. Did you know that the first Bermuda race went from Brooklyn to Bermuda? Do you know what controversies surrounded the first start? What one addition to the Bermuda Race probably made the biggest difference in its success? It's all there in John's beautifully written, elegantly laid out, and smartly chronicaled tale. I cannot think of a better holiday or birthday gift for the sailing enthusiast. Other books by John Rousmaniere include In a Class by Herself (about Bolero) and Fastnet Force 10. To view photos from the start of the Centennial Bermuda Race, please click here.